Do you have a large number of DVD collections and would like to upload your DVD contents to YouTube so as to share them with your friends? The problem is DVD file (such as .VOB, .IFO and .BUP) is formated in MPEG-2, which is not supported by YouTube and you might end up with an error message "invalid file format". How to upload a DVD to YouTube without YouTube upload limits? Follow the guide below. MacX DVD Ripper Pro - a reliable DVD ripper for Mac and Windows which helps you to rip DVD to YouTube supported video formats and codecs like MP4, FLV, WebM, WMV, HEVC, H.264, etc. without any loss of quality. It rips both homemade and encrypted DVDs with Region Code, CSS, Sony ARccOS, Disney X-project protection, etc. - Each video you are uploading should be less than 15 minutes by default. Google Account needs to be verified if you want to upload longer DVD to YouTube. - YouTube isn't too harsh on the video size and length. Even if your DVD video larger than 20GB can be uploaded to YouTube as long as you have the latest browser. The maximum file you can upload is 128GB or 12 hours. 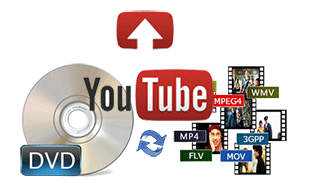 Then how to rip DVD to FLV, MP4, WMV, FLV and other digital video formats for YouTube. 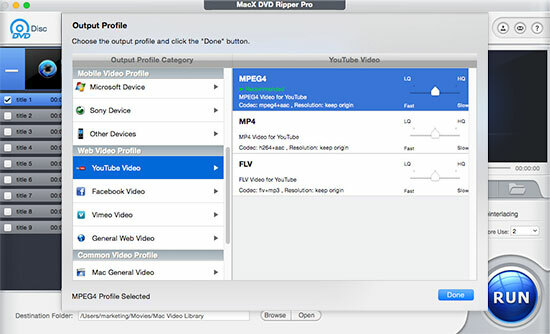 What you need is MacX DVD Ripper Pro (You can go to its Mac version, too.) It is a professional DVD ripper that is able to convert DVD to MP4, FLV, MOV, or any other YouTube accepted video formats. It works perfectly on any DVDs and enables to rip protected DVDs encoded with CSS, Region Code or more, damaged/unplayable DVDs, let along the homemade DVD discs without any hassle. Nearly original quality can be remained thanks to high quality engine embedded into the DVD ripper. The level-3 hardware acceleration tech enables the fastest possible DVD ripping process with perfect balance between quality and size. 1. Edit DVD video for YouTube uploading. The DVD to YouTube converter software allows you to do some basic video editing, such as trimming video segment from DVD movies, adding external subtitles, cropping unwanted black bars, adjusting aspect ratio, merging DVD files into one, etc. 2. Adjust DVD Video Parameter Settings for YouTube. You can adjust DVD video audio parameters for specific use, such as video codec, bit rate, frame rate, resolution, audio channel, sample rate etc. 3. Compress DVD video file without decreasing much quality. It also works as a DVD compressor, letting users shrink DVD video size by adjusting res, frame rate, bit rate etc. for faster uploading without changing image quality. Free download the DVD converter for Mac or Windows edition on PC and import DVD movie or load DVD folder by clicking "DVD Folder" button. Step 2: Choose a YouTube supported video audio format. 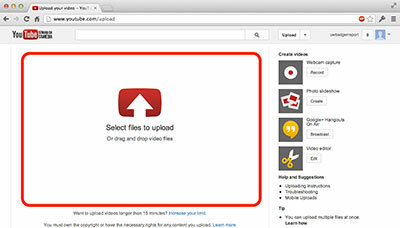 Click and choose the output format for uploading to YouTube. Go to Web Video Profile > YouTube Video > choose MPEG4, MP4, FLV as per your need. Note: If you just want to upload a clip of a DVD video instead of a whole content on YouTube for sharing, you can trim the video to cut unwanted part and get the essence you like before hitting "RUN" icon. Click "Edit" button at the end of the corrent title. Here you are allowed to clip the video segment from the DVD movie, and then add external subtitles to the movie you want to upload to YouTube. Specify an output folder on your computer to save the output files. Click the "Browse" to choose the path where you want to save the output files in. Step 4: Start DVD to YouTube video conversion. Note: By default, YouTube plays video with 16:9 aspect ratio player. Technically, if you are uploading a non-16:9 DVD video, either pillar boxes or letter boxes will show on the display. So we highly recommend you to crop your DVD movie and make a 16:9 ratio to avoid any black bars around the player. See how to change aspect ratio to 16:9. Disclaimer: MacXDVD Software only advocates copying and ripping DVDs under the concept of Fair Use and does not encourage any illegal reproduction or distribution of copyrighted content. Please abide by the local DVD copyright law before doing it. Please DO NOT upload protected DVD movie unless you have written permission from the copyright owner. After you get ready for your DVD video, go ahead to upload it to YouTube. 1. Sign up for a free YouTube membership, or login into YouTube if you've already had an account. 2. Click the record-shaped icon and tap "Upload Videos" at the upper right corner of YouTube page. 3. Choose the converted DVD video you want to upload to YouTube. 4. Enter basic information about your DVD video, including Title, Description, Tags, and Category. You can define your privacy setting and advanced setting before uploading the DVD video. 5. Click Publish button to begin the uploading. the speed depends on the file size, video resolution, bandwidth, and YouTube itself. The 2019 best free DVD rippers for Mac (Mojave supported) are much easier for you to free rip your DVD collections (incl. protected DVDs) to MP4, MOV, H.264, HEVC, iTunes, QT, etc for your Macbook, iMac, iPhone, iPad, Apple TV, etc. Rip DVD for free on your Mac with no error. This is a brief guide to show you how to rip DVD to FLV with smaller size and fast speed. With this free DVD to FLV converter, it can help you rip and convert protected and homemade DVDs to YouTube supported format FLV at ease. Facebook neither supports DVD format nor accepts videos larger than 1GB. Follow the tutorial to rip and convert DVD to MP4, MOV or other Facebook supported formats and codecs with smaller size. MacX DVD Ripper Pro is the best DVD to YouTube converter to convert DVD to YouTube MP4, FLV, MPEG4 and lots of digital formats on your Mac. It's a handy thing to have when you're trying to back up your DVD collection.